If you’re like me, you’re not really an audio engineer despite all your research and efforts into capturing high quality sound in your home studio. Though it’s increasingly easy to buy quality gear, that doesn’t mean you have the training or experience to master it. Enrolling in engineering school, sound proofing your house, and upgrading thousands in gear is all time consuming and expensive. Fortunately, there’s an easy and fairly cheap way to record great sounding guitars. It’s called re-amping. 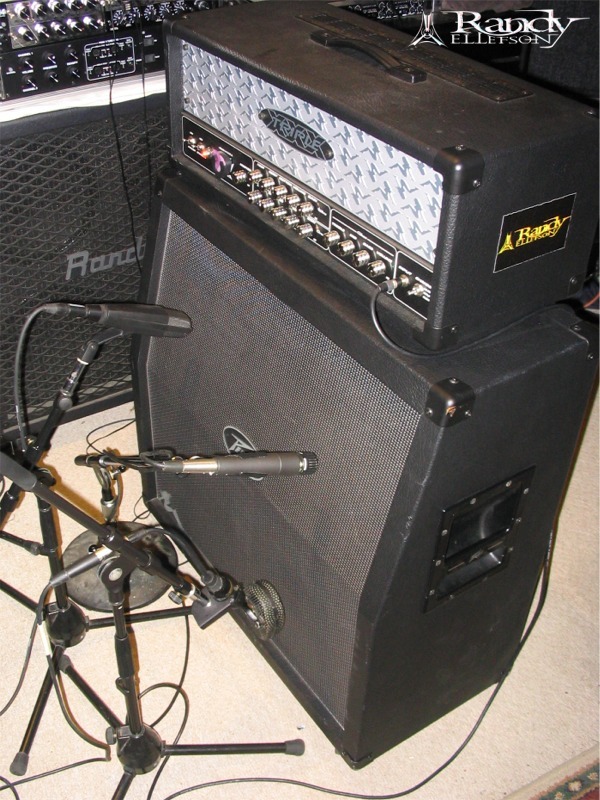 Re-amping is when you change the sound of a guitar amp on a recording after it was recorded, thus “re-amping” it. In order for this to work, the pre-recorded signal must be the one directly from a guitar. It can’t have already gone through an amp before it was recorded because the sound of that amp is permanently part of the recording. This requires a little planning and at least one special piece of gear. In the traditional approach to recording, the guitar signal goes through any effects you’re using, into your amp and then out the amp’s speakers. Microphones then transmit this sound to tape, often after the signal passes through studio effects. All of this happens in a soundproofed room with expensive gear. With re-amping, the process is different. The signal from your guitar may still go through your effects, but most of this should be avoided. You can still add these effects later during re-amping. The exception to this is the wah pedal, since your performance is both your hands and what you’re doing with that pedal, but this can also be added during re-amping, though it can feel weird to do so. The signal from your guitar should go into a direct box such as the SansAmp XDI, which converts the guitar’s high impedance output to a low one required by mixing consoles. It also reduces the chance of electrical disturbance from nearby objects. After this, you have to get your signal into your recorder somehow. There are many options for this but since I’m no expert, I will focus on computer based recording as I did it on my new album, Some Things Are Better Left Unsaid. You should still be able to take the principles and apply them to your own situation. If you’ve already got a computer based recording system, you already have an interface for getting signals directly into your computer software. In my case, I am using Digidesign Pro Tools LE with the Digi 001 interface for it. The signal from my guitar goes through the direct box and then straight into one of the Digi 001’s inputs. From there the signal goes into the computer and Pro Tools. “Play” Aux (Stereo) – takes the guitar input and routes the signal to “Amp” Aux. No effects. “RecordGtr” Aux (Mono) – takes the guitar input and routes it to bus 4 (the input for all Audio tracks). 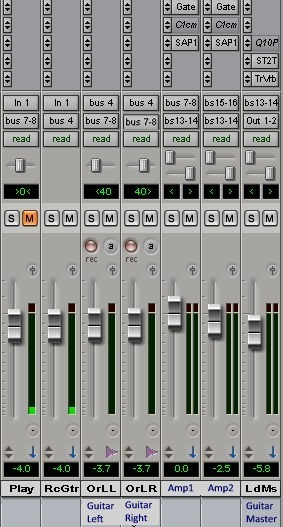 I can also control the level sent to Audio tracks with this. No effects. “Amp” Aux (Stereo) – receives input from either “Play”; or “GuitarLeft” and/or “GuitarRight”, and routes output to “GuitarMaster”. Has noise gate and amp simulator plug-in on it. “GuitarMaster” Aux – receives output of “Amp” and adds reverb. Of course, in addition to these, I have the actual Audio tracks for however many guitars I need. Let’s keep it simple and say it’s two rhythm guitars: right and left. So I also have this. “GuitarLeft” Audio (Mono) – receives input of “RecordGtr” on bus 4, and routes to “Amp” Aux. No effects. “GuitarRight”. Same. One is panned left, the other right. Since I generally perform rock music, I want it to sound distorted, so how do I do that without using an amp? I use an amp simulator. In my case, it’s the SansAmp PSA-1 software plug in that now ships with Pro Tools. This is only found on the “Amp” Aux track (indicated by “SAP1” on the picture). You’ll notice there are no effects on any of these except “Amp” and “GuitarMaster”. This means the signal from the guitar is going to the hard drive bare as the day it was born. Only after that is it routed into effects. This is how you preserve the original signal and still hear distortion or whatever effects you have loaded on your DAW (Digital Audio Workstation) as you perform. You simply place these effects after the audio tracks in the signal chain. To go from playing along to recording, all I have to do is mute “Play”, record enable an audio track, and hit the record button. The latter two steps are mandatory for everyone anyway, so with this setup I have only one extra button to push. When recording a guitar hard panned to one side, I usually want to hear the guitar on both sides, so instead of muting I often just changing the panning on the “Play” track to be opposite of the recorded track, and these can include anything from flangers, to a chorus, reverb, delay, phaser, EQ, etc. Now that you’ve recorded your masterpiece with the raw guitar signal, hearing a workable amp tone in the process, it’s time to change your mind about what it sounds like. This is the real power of re-amping! The simplest version of re-amping is this: launch the amp simulator, turn the dials, and viola: you have re-amped. If you really want top level results, however, nothing substitutes for a real amp cranked up and recorded with high quality gear by an engineer who knows far more than you do about what he’s doing. There’s nothing unusual about this, with one exception. Just as you used a direct box to change the impedance and otherwise improve the signal quality going into your computer, you now need something similar to reverse it. The Radial X-Amp is designed for this purpose, and the pro studio may already have one. You just route the signal from the mixing console into this and out the other side, and then straight into your amp unless you want to go through your pedal board first, for example. Otherwise it’s pure traditional recording, except you’re twiddling your thumbs in the control room instead of sweating over your performance and how much your multiple takes are costing you. You and your engineer are also able to tweak your amp sound to fit better in the mix with the drums and bass. When I re-amped my album, I decided to add a wah to one lead guitar phrase and easily did so simply by placing the wah before the amp in the signal path, just like normal. My engineer set this up so that I stood in the control room while doing it. If I had wanted to add other traditional pedals, such as a phaser, I could have done this, too, but I ended up using studio effect instead partly to further keep my options open. Another cool trick we did was simulating the sound of a guitar with the volume knob turned down. We just turned down the volume control on the X-Amp. It sounded exactly like turning a guitar knob. I had recorded the performance (the opening riff of the sound clips below) at full volume. In the independent artist community, there’s a lot of enthusiasm for doing everything yourself, like a badge of honor, but don’t get too swept up in this like I once did. You might be a better engineer than me. I never kept track of the hours I spent recording Some Things Are Better Left Unsaid, but if done in someone else’s studio at a cost of $60, it would have cost thousands. I also would’ve had to record on someone else’s schedule and availability. Re-amping stereo riffs and a single lead guitar on ten songs only cost me $700. That’s $70 per song, or the equivalent of spending only about 1 hour to perform all the guitars on a song, not to mention setup and tuning. That’s hard to beat.